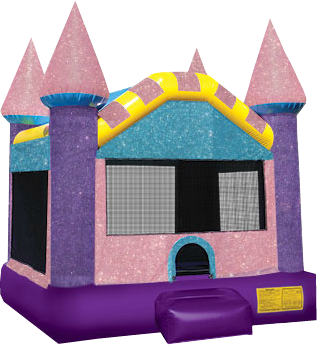 Our Dazzling Castle FunJump is 360-degrees of brilliant and joyful regal fun for all young royalty! Your princess will rule in this brilliantly-colored castle that actually shimmers and sparkles in the sun! This beautiful fun jump is perfect to suit any princess party theme. The weight limit for this jump is 500lbs. This rental's based price is for 6 hours. If additional rental time is needed we do offer overnight rental which is 25% extra.